Hotel Maiyango in the heart of Leicester city centre is one of our favourite wedding venues. Maiyango’s superb food, cocktails and attention to detail make it a fantastic venue to hold a wedding reception at. We are the recommended supplier of DJs, dance floors and lighting at Hotel Maiyango. The photos above are taken at 2 different wedding receptions in the Gallery room at the hotel. Both bride and grooms booked one of our wedding DJs and a 12ft x 12ft black starlit dance floor. One couple also booked our LED Uplighting which was set to purple to match the colour scheme for the room. 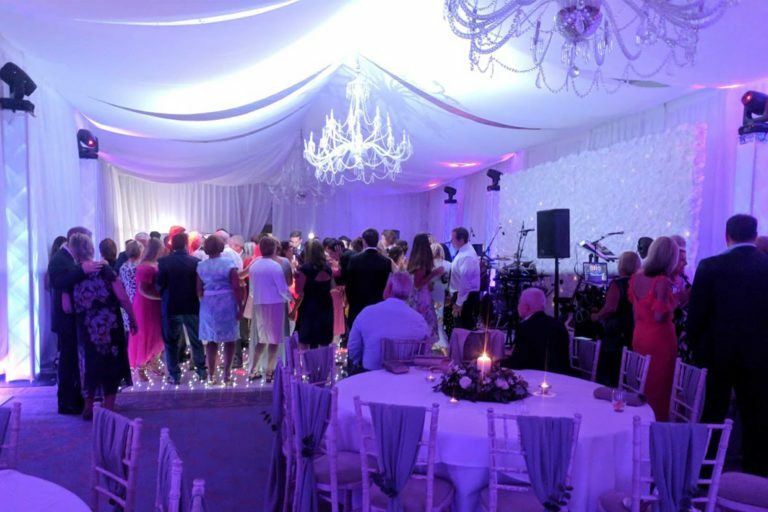 A 12ft x 12ft starlit dance floor is in our opinion the best size dance floor to book for the Gallery suite, we could if required make it larger and rectangular however. Many bride and grooms keep the dance floor turned off until their first dance and as they step on it comes to life and starts to twinkle to provide an added WOW factor. To find out more about booking any of our products or services for your event at Hotel Maiyango in Leicester please don’t hesitate to pick up the phone and give us a call on 0116 2029953, or simply send us an email. We look forward to hearing from you.